Cate usually falls asleep surrounded by at least a few chapter books. She carries a book with her when we go to church or basketball games. She checks out at least seven books at a time when we go to the library. And she reads books over and over again. 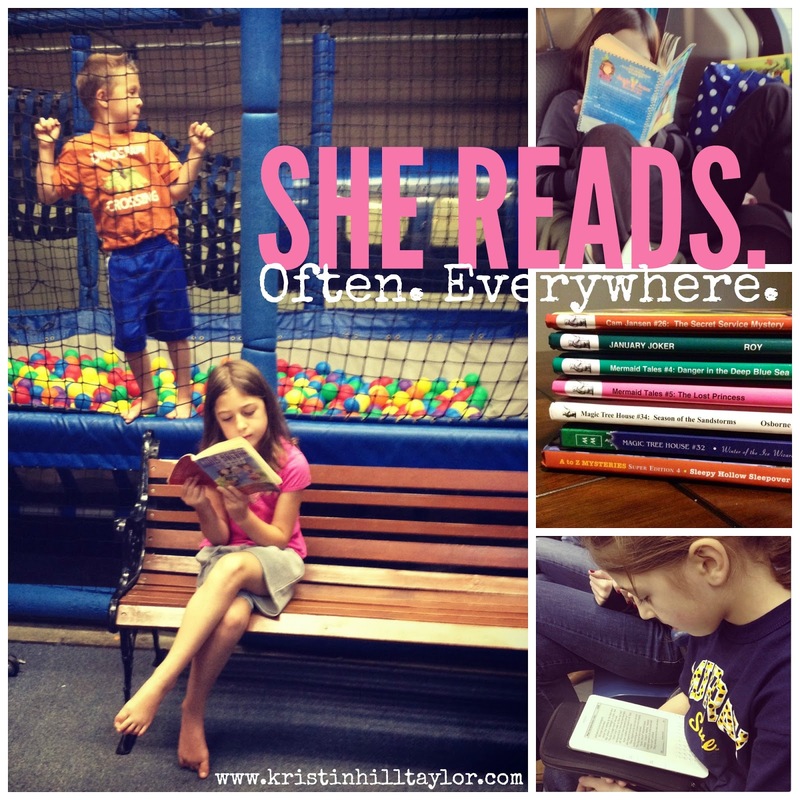 I’ve loved watching her devour books this summer, falling in love with fictional friends and retelling the stories. I got Cate, who is getting ready to start second grade, to look up from the pages of The Boxcar Children long enough to tell me about her favorite series of books. She likes reading mysteries that aren’t scary, characters who are funny, and anything about horses. I bought the first book in the series at a yard sale several months ago and Cate recently checked out more from the library. “I like learning new things from them,” Cate said. These make Cate laugh out loud and sometimes she reads to me parts she loves. “She’s funny and crazy,” Cate said of Junie B.
Cate had devoured these. She started reading them in order and then realized there were so many the order probably didn’t matter. She’s asked questions about the Titanic and Civil War while reading about Jack and Annie’s adventures lately and she even got to see a rendition of “Dinosaurs Before Dark” at the local community theater. We happened upon these at the library this summer and Cate has been hooked. “The mermaids make new friends and cheer up each other,” she said. Greg and I read aloud a couple Ramona books in previous years before Cate was ready to read them on her own, which she’s been doing for awhile now. “She’s even crazier than Junie B.,” Cate said about Ramona Quimby. These make Cate laugh out loud. And there are more of them than I originally thought. I know because I bought them for her from Half.com. Having a chapter book reader has me reminiscing about my own childhood reading adventures. What books do you remember loving or are you seeing your kids love? I linked up this post with the Creative Home Keeper’s monthly Book Notes. This post contains Amazon affiliate links, so if you buy something through these links I will receive a tiny portion but the prices don’t change for you. Thanks for supporting this blog. I bet she would like the Fudge book series by Judy Blume. And I have a feeling she would love Nancy Drew! Megan is currently into Ron Roy (a to z mysteries, capital mysteries), Piper Reed, Gooney Bird (we listened to this on a trip, I really liked them) and American Girl to name a few. Oh, yes, Cate has read a few of the A to Z Mysteries and the ones that are month names as well as American Girl. Clearly our girls share taste in books. I'll have to check out those other ones. Yes, I have some Judy Blume, including one or two Fudge, but I thought they might be a little above her reading level, but I could be wrong. I like to stock up on books at yard sales. I had kind of forgotten about Nancy Drew, but those would be good too.